Uglyworld #658 - Choco Chippo's (201-365), originally uploaded by www.bazpics.com. When I asked the little guys if any of them wanted anything from the supermarket I should have already expected the reply which came from Babo, "Super duper choco chippo cookies". I wasn't even sure that the supermarket would stock this particular style of cookies, so I suggested to Babo that maybe it would be best for him to come with me - do you think he agreed, hell yeah! When we reached the supermarket I can best explain the next 5 minutes by letting you think of how a police dog can sniff out drugs, I tried my best to stay a metre or two behind Babo as he went scurrying around so fast that one old woman asked if he was feeling ok. Babo turned (without stopping his search) and said, "Yes, I is cookie searching". 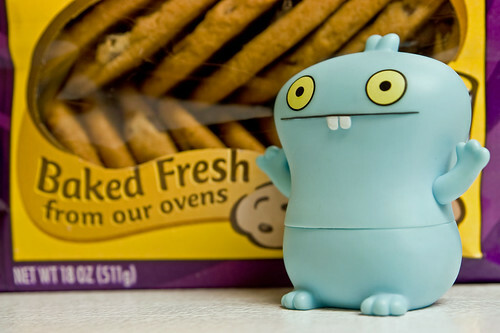 The speed of Babo was really hard to deal with and he managed to get away from me, so it left me to search each of the isles one by one until I found him sitting on the floor pointing up onto a high shelf where the cookies lay. I initially picked up a small packet of them to which Babo commented, "Haaaaaaaay!" so I put it back on the shelf and took the biggest one to "Betters!" from Babo. Once back in the hotel I had to make him promise not to eat them all before I could shoot a photograph of him with them (I had to tell him it was to show Wage back home in Aachen in order for him not to munch them straight away).